GB Labs has single-handedly developed a unique platform that tackles the shortcomings of traditional storage area networks. Space has been tested within the most demanding environments and has gleaned critical acclaim for speed and ease of use. The interface is very easy to use and administer, in fact a complete SAN can be installed in under an hour, impressive considering most fibre SANs can take days! This means a significant reduction in down time during installation or indeed when it comes to expansion at a later date. It also allows our customers to be virtually IT support free compared to the high support levels that a Fibre Channel SAN requires. The Space Family is available from the ultra portable Mini Space to the full-fat Space cluster, offering you the perfect solution whether you are in Post Production, Broadcasting, Education, Medical Research or even Government and Military. If you need to edit video and are looking for virtually unlimited capacity with built in expansion and extensive warranty options, then Space really should be your only option. "Full Speed, Fully Expandable The Ultimate Scalable Central Storage Solution for the Video Professional"
Space is ideal for larger workgroups, as it builds on the Mini or Midi Space to offer increased capacity and performance using 16 rather than 8 drives. Its flexible expansion units let you scale capacity and performance as need be. Optimised for digital content creation, Space works with any mix of Mac, Windows or Linux clients. It’s safe, fast and cost-effective – the perfect solution to an increasing need for quick, secure data storage. Able to use standard Ethernet connectivity, Space is easy to install without new cabling or client adaptor cards. Space comes with four 1G Ethernet (GbE) ports for connecting client workstations. For best performance with GbE clients it’s best to channel bond these ports to a GbE switch and connect client workstations to the switch. When you use Space with a Space Ex you’ll enjoy even greater performance. To maximise this, simply fit a 10GbE Ethernet card and use 10GbE connection with a GbE switch. Space has additional expansion slots to add up to five more cards. You can use these to increase the number of GbE clients directly connected to Space without a switch. 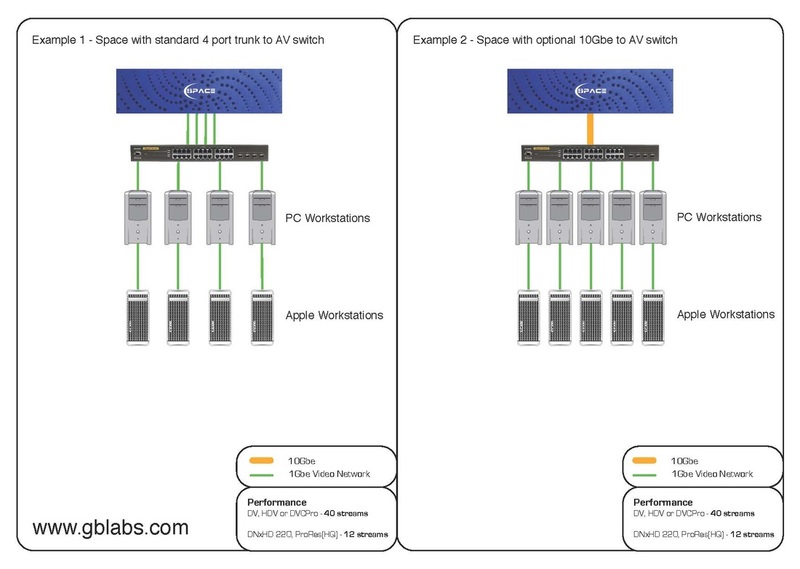 Or add up to ten 10GbE ports and connect client workstations needing more performance than a GbE connection can offer. The expansion slots can also be used to add extra RAID cards to support more Space Ex units and faster speeds.